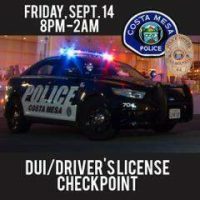 DUI checkpoints like this one are placed in locations based on collision statistics and frequency of DUI arrests, affording the greatest opportunity for achieving drunk and drugged driving deterrence. Locations are chosen with safety considerations for the officers and the public. Drivers caught driving impaired can expect the impact of a DUI arrest to include jail time, fines, fees, DUI classes, license suspensions and other expenses that can exceed $10,000. In recent years, California has seen a disturbing increase in drug-impaired driving crashes. CMPD supports the new effort from the California Office of Traffic Safety (OTS) that aims to educate all drivers that “DUI Doesn’t Just Mean Booze.” If you take prescription drugs, particularly those with a driving or operating machinery warning on the label, you might be impaired enough to get a DUI. Marijuana can also be impairing, especially in combination with alcohol or other drugs, and can result in a DUI. The deterrent effect of High Visibility Enforcement, using both DUI Checkpoints and DUI Saturation Patrols, has proven to lower the number of persons killed and injured in alcohol or drug impaired crashes. Research shows that crashes involving an impaired driver can be reduced by up to 20 percent when well-publicized proactive DUI operations are conducted routinely. In California, this deadly crime led to 1,155 deaths and over 24,000 serious injuries in 2014 because someone failed to designate a sober driver. Studies of California drivers have shown that 30 percent of drivers in fatal crashes had one or more drugs in their systems. A study of active drivers showed more tested positive for drugs that may impair driving (14 percent) than did for alcohol (7.3 percent). Of the drugs, marijuana was most prevalent, at 7.4 percent, slightly more than alcohol. Everyone should be mindful that if they are taking medication – whether prescription or over-the-counter – drinking even small amounts of alcohol can greatly intensify the impairment affects. There are many options out there to get home safely. There is no excuse for getting behind the wheel impaired. To avoid putting others and yourself at risk of a DUI, always designate a sober driver, or use public transportation or a ride sharing service to get home. If a friend or family member is about to drive buzzed or impaired, take the keys away and arrange to get them home safely. Funding for this checkpoint is provided to CMPD by a grant from OTS, through the National Highway Traffic Safety Administration, reminding everyone to ‘Report Drunk Drivers – Call 911’.